"Hemlock Hideaway," a private 2-bedroom Smoky Mountains cabin rental, rests in a quiet wooded setting in Elks Cove. 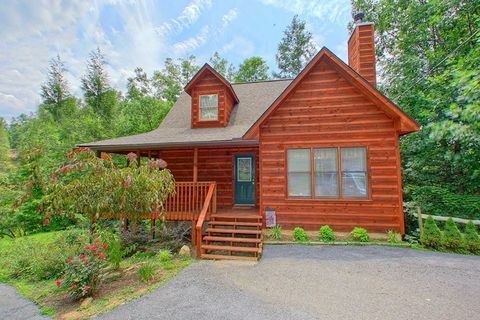 With all the in-cabin amenities to make you feel right at home and a convenient location to nearby Gatlinburg attractions, this Smoky Mountains cabin rental offers you and your family an unforgettable mountain vacation destination. 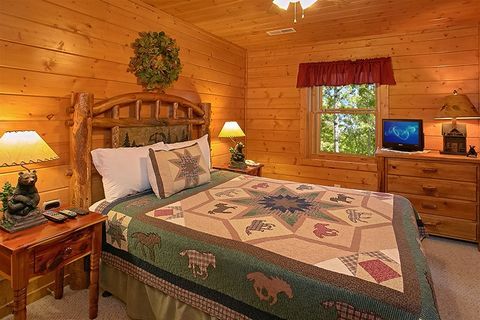 Your private 2-bedroom Smoky Mountain cabin provides a true mountain home-away-from-home with premium furnishings, WiFi Internet, a year-round hot tub, and more. 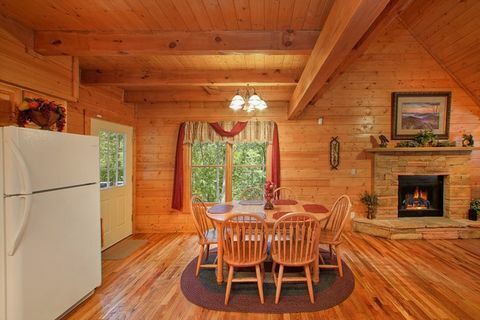 With sleeping arrangements for up to 7 guests, there's plenty of room for the entire family to relax in the Smokies. 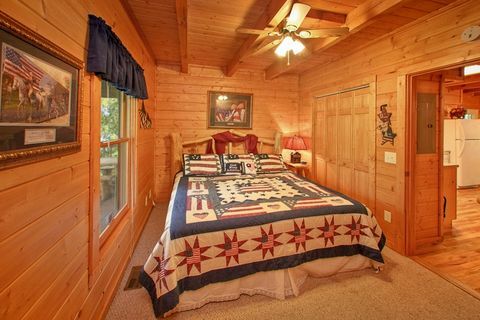 The downstairs master suite features an expansive, custom carved king-size bed and a jacuzzi tub in its full-size bath. 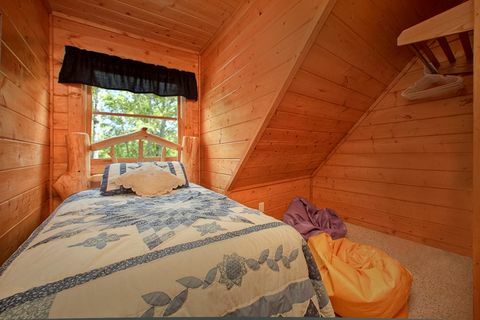 Upstairs, a queen bedroom and cozy child's rooms with a twin-size bed provide additional sleeping space. 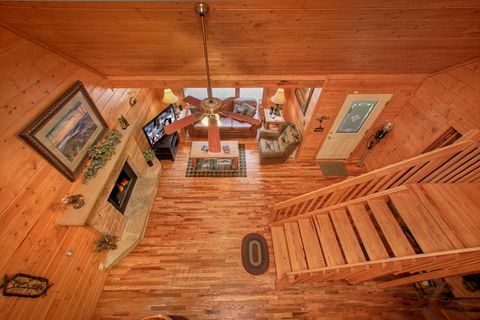 Downstairs, "Hemlock Hideaway" boasts welcoming living room features a comfortable sleeper sofa, a gas fireplace with inviting stone mantel, and a relaxing recliner. 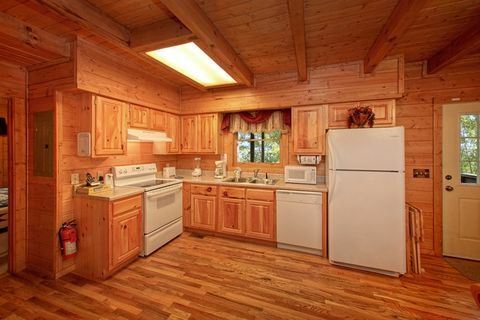 The cabin's dine-in kitchen offers a place to prepare and enjoy family meals. 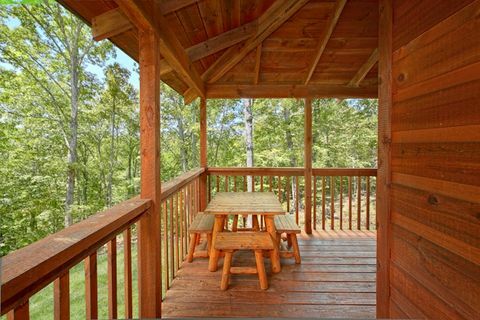 Outside, a barbecue grill invites you to host a cookout in the mountain air. 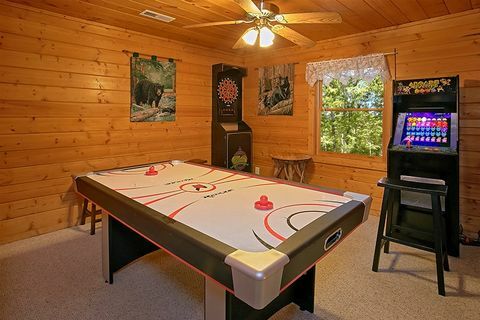 Venture out for days filled with fun and excitement in the Gatlinburg Arts and Crafts Community or downtown Gatlinburg, then return to your Smoky Mountain cabin rental for a relaxing dip in the hot tub or play games of air hockey, darts, and video games in the cabin's game room. 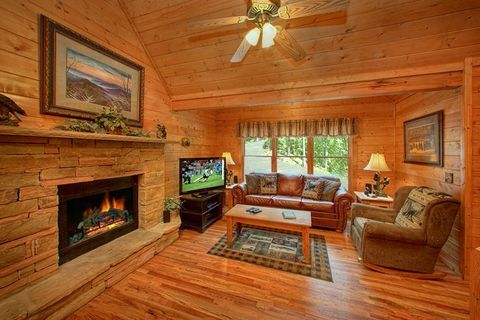 Find additional entertainment using the rental cabin’s WiFi Internet to stream movies and games. 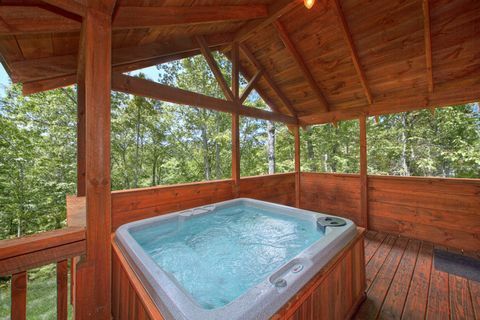 Ready to escape to the South’s biggest playground? 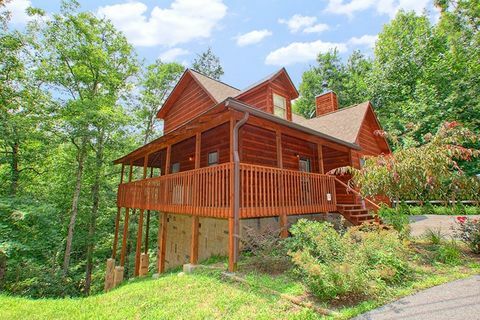 Book "Hemlock Hideaway," your private 2-bedroom Smoky Mountain cabin rental online for an immediate Online Cabin Discount!